Before I had children, long before I joined the world of breastfeeding support, I studied ecology. It was exciting and interesting and sometimes I miss it a lot. 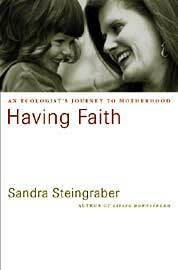 I just came across a book that lets me enjoy both my current (lactation) and my former (ecology) interests: Having Faith: An Ecologist’s Journey to Motherhood by Sandra Steingraber. In some ways, breastfeeding is a relationship more intimate than pregnancy. Whereas the placenta disallows direct transfer of maternal blood into the infant, breast milk carries white blood cells from the mother directly into the baby. Every time I breastfeed Faith, antibodies and living cells from my blood are sent coursing through her blood, physically enacting the hopes of every mother for her child — that I can keep you from harm, that you can learn from my past sufferings.